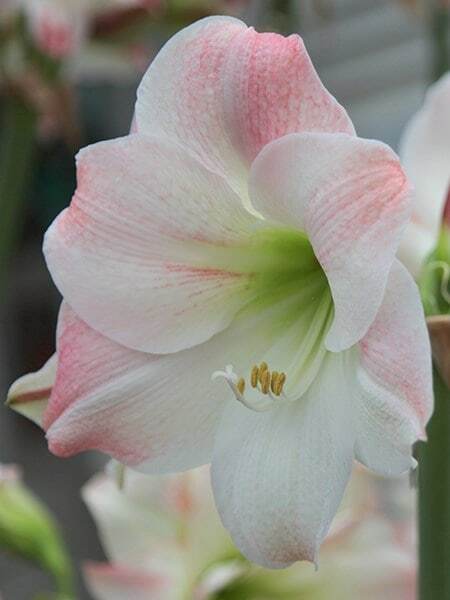 Buy Hippeastrum 'Apple Blossom' amaryllis Apple Blossom bulb: Softly coloured perfection! Each green-eyed trumpet-shaped bloom is a sublime blend of creamy white and pink, so the overall effect is really pretty. It's perfect then for adding soft colour to the home for several weeks during the coldest months of the year - and it's a holder of the prestigeous RHS AGM, so this is one of the finest amaryllis you can grow. Beautiful long lasting flower display.